After many years of battling with change, HMV fell into administration this month. The music store has graced our high streets for nearly a century, but in recent years failed to compete with the download market (both legal and illegal) and big online competitors. With its future in the balance, its demise or rebirth could have a significant impact on the high street. If HMV were to go, it would be nice to think that their custom would go to independent retailers who offer a more detailed and varied catalogue, compared to HMV's overview. However, I personally think that the people who want to shop at an independent store, already do, and the customers will almost all turn to an online outlet or their local supermarket chart shelf offerings. This would significantly impact the music industry as HMV is one of their biggest consumer points, so it is no doubt to hear that the big studios are backing potential buyouts. If HMV gets the buyout it is hoping for, one thing is for certain; change is critical. In recent years the store has tried to adapt with the times and branched out into clothing, technology and literature. In doing so it was spread too thin; not really offering the best in any area. My suggestion? When faced with a huge problem, strip everything back to basics, deal with the essentials and tackle the problem at the core. HMV should be there to sell music and films. The technology is better sold by the tech stores; sure stock a few headphones, maybe some speakers, but not half a stores worth. The next big step would be to invest in their staff. The staff at HMV can be helpful, but only as much as any other supermarket employee, or clothes store assistant. Last month I walked in and noticed they were playing 'Less Than Jake' but I wasn't sure what album/compilation. I walked up to the counter and asked the man standing there, to which he responded by showing me the CD case, and then continued labelling Cd's. There was a perfect chance to inform me (verbally) what the CD was, where I could find it, and if I liked that, what else I might like that the store stocked. Finally I think the company should downsize. This may not seem logical as it could result in a smaller net profit for the company, but right now they are biting off more than they can chew, running huge stores filled with disappointing stock. It may be sensible to accept a smaller return for a more secure future. 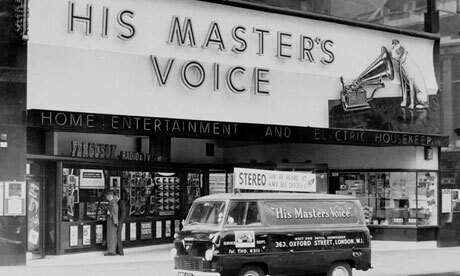 So will HMV be gone and forgotten this time next year, or will it be back and striving in an ever changing market?